A gas pump is covered with an out of service message as fuel ran out ahead of Harvey's arrival near the Texas coastal area, in Houston, Texas, Aug. 25, 2017. Hurricane Harvey has barreled into the heart of the U.S. oil and gas industry, prompting the sudden evacuation of workers. 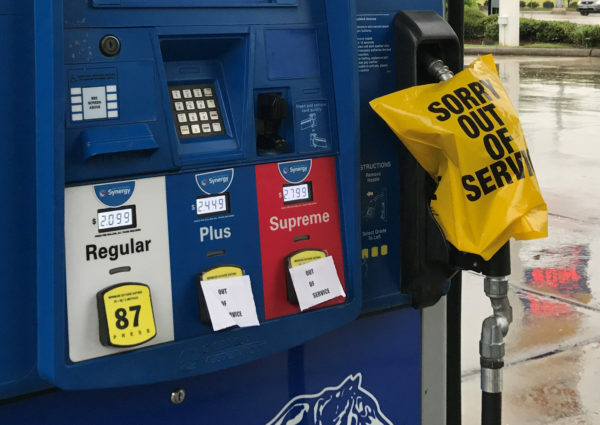 Spot prices for gasoline are expected to jump Monday, but the full extent of damage will not be clear for days, companies and experts said. Oil and gas companies have shut down about a quarter of oil and gas production in the Gulf of Mexico, according to a U.S. Bureau of Safety and Environmental Enforcement survey. That would be about 5 percent of nationwide output. Companies have also been shutting down much of their refinery operations onshore, idling about 10 percent or more of the nation’s refinery capacity. That might not only raise prices and create temporary shortages in the Gulf Coast area but could also boost prices in places as far away as the Northeast, where a portion of gasoline supplies are delivered by pipeline from the Gulf. S&P Global Platts estimated Saturday that about 900,000 barrels a day of refinery capacity had been closed, about 5 percent of nationwide capacity. More plants closed Sunday, including two of the country’s biggest — Shell’s Deer Park and ExxonMobil’s Baytown, with about a million barrels a day of capacity between them. Initially, companies were closing facilities in Corpus Christi, but the latest closings were on the Houston ship channel. How long the shutdowns will last wasn’t clear Sunday. Petrochemical refineries also were closing, which will likely dent the economy over the next week. Chevron planned to shut down its Cedar Bayou facility through Sept. 6 because of the storm, according to PetroChem Wire. Harvey also was putting a damper on shale oil and shale gas drilling in the Eagle Ford shale play, a strip of lucrative wells at the northern edge of the storm. About 75 exploration rigs that had been drilling there last week have been idled, too. Shell spokeswoman Kimberly Windon, working from home in a Houston neighborhood damaged by tornadoes, said Sunday afternoon that the company had closed its offices and was shutting down the sprawling Deer Park refinery and chemical plant, which is along the Houston ship channel. About 2,500 ships are loaded or offloaded there every year. About 1,500 Shell employees and about 1,200 contractors work there. ExxonMobil said it was shutting down the Baytown complex, one of the nation’s largest oil and petrochemical refineries. The complex, on the Houston ship channel 25 miles east of Houston, employs about 7,000 people. Shutting it down takes about a day. Valero, the nation’s largest oil refiner, closed its Corpus Christi and Three Rivers refineries. The company was also helping employees from the hard-hit Rockport area, putting many of them in hotels. It remains unclear how markets will react Monday. Crude oil prices could remain stable. Cuts in output offshore in the Gulf of Mexico and onshore in the Eagle Ford shale play that would reduce supplies have been outweighed by the idling of refineries. But gasoline prices, which rose last week, could jump further.